Jaclyn Jose refuses to answer if her daughter Andi Eigenmann and Jake Ejercito are back in each other's arms. 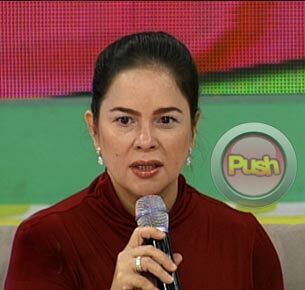 Jaclyn Jose said that all is well between her and daughter Andi Eigenmann after the two had a misunderstanding last year. The said tiff stemmed from Jaclyn’s statement to the press that the parents of Andi’s then boyfriend, Jake Ejercito, did not approve of Andi for their son because she is a single mom. Jaclyn continued that her daughter may have harbored ill feelings towards her for speaking her mind, but she justified that she did that out of love for Andi. “Siguro nagtampo siya sa akin talaga, but you know ang sa akin lang naman for future suitors or companions, they must know [that] if they will love Andi, they have to love Ellie also, to be proud of Ellie also.” She further said that she intends to fight for her granddaughter because she loves her so much. One reporter then asked Jaclyn if rumors were true that Andi and Jake are now back in each other’s arms. “Si Andi na lang ang tanungin mo kasi nag-promise ako, kasi mahirap eh. Sumasama ang loob sa akin [ni Andi].” If ever these rumors were true, Jaclyn said that she is not against it, and what really mattered to her is that she was able to speak her mind and get the message across concerning Andi’s status as a single mom. She was also candid enough to say that she will stand by her statement that Jake’s parents do not approve of Andi being a single parent, but added that she would rather not talk about the issue. “Ayoko ng intriga,” she concluded. Jaclyn revealed that she has not yet reconciled with Jake’s mom, Laarni Enriquez, but quickly added that she didn’t mean to hurt their feelings but she just wanted to be honest.